The longtime GOP strategist Roger Stone said Sunday that he would be open to testifying about his conversations with President Donald Trump. The concession could help investigators piece together big parts of their inquiry into whether Stone served as a conduit between the Trump campaign and WikiLeaks during the election. In one instance that’s likely to draw scrutiny, the two men had a late-night phone call on the same day Stone learned from another contact, Jerome Corsi, that WikiLeaks was gearing up to release „damaging“ material on the Hillary Clinton campaign. Corsi also told Stone, before Stone’s phone call with Trump, that it „would not hurt“ to begin floating the rumor that Clinton was not well. In the days after, Trump began testing out the talking point. Both Stone and Trump have said they never discussed WikiLeaks or Assange. The longtime GOP strategist has not ruled out cooperating with the special counsel Robert Mueller in the ongoing Russia investigation. „If there’s wrongdoing by other people in [President Donald Trump’s 2016 campaign] that I know about — which I know of none — but if there is, I would testify honestly,“ Stone said on ABC’s „This Week“ on Sunday. 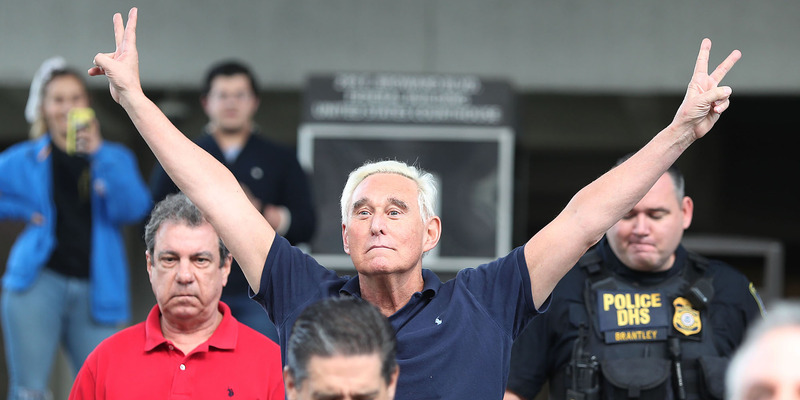 Stone was arrested Friday after a grand jury indicted him on seven counts of obstruction, false statements, and witness tampering. Mueller scrutinized the many late-night phone calls between Trump and Stone that took place during the 2016 campaign season. The calls drew prosecutors‘ attention as they investigated whether Stone or anyone else served as a conduit between Trump and the radical pro-transparency group WikiLeaks during the election. Stone has said he never spoke to Trump about WikiLeaks or Assange. The Kremlin is known to have used WikiLeaks as a propaganda tool to disseminate emails Russian hackers stole when they breached the servers of the Democratic National Committee during the 2016 campaign season. The US intelligence community determined in 2017 that Russia hacked the DNC in order to tip the election in Trump’s favor. Stone’s links to WikiLeaks and its founder, Julian Assange, are well-known. He exchanged Twitter direct messages with the Russian hacker Guccifer 2.0, who helped WikiLeaks disseminate the stolen Democratic emails. Stone is also known to have exchanged direct messages with WikiLeaks‘ main account on Twitter in October 2016. And he was corresponding throughout the summer with the far-right commentator Jerome Corsi and the radio host Randy Credico about obtaining the hacked emails from WikiLeaks that had not yet been published online. Stone spoke to Trump over the phone later that same day. It’s unclear what their conversation was about. In the days after, Trump began suggesting Clinton was not well. Shortly before that appearance, Trump said Clinton lacked the „mental and physical stamina“ to fight the Islamic State. Trump has denied that his campaign had any connection to or advance knowledge of WikiLeaks‘ plans. But in their charging document against Stone, prosecutors wrote that someone directed a senior Trump campaign official to maintain a channel of communication with Stone about WikiLeaks. The identity of the senior official and who directed them has not been made public. Trump’s son, Donald Trump Jr., is also known to have been in contact with WikiLeaks during the election. Stone struck a defiant tone after being arrested Friday. „This country is literally run by a rogue prosecutor who has more power than the president,“ he said in a statement relayed by his lawyer to his colleagues at the far-right conspiracy website Infowars on Friday. Asked Sunday on „This Week“ whether he was cooperating with prosecutors, Stone said, „I don’t want to address that question,“ but repeated that he would not testify against Trump. He also echoed Trump’s attacks on Mueller and the Russia probe, and added that Trump had never suggested pardoning him.